The Vikos Gorge is a gorge in the Pindus Mountains of Epirus, northern Greece. It lies on the southern slopes of Mount Tymfi, with a length of about 20 km, depth ranging from 450 m to 1600 m and width from 400 m to some meters at its narrowest part. The Vikos Gorge is listed by the Guinness Book of Records as the deepest canyon in the World in proportion to its width, though some gorge lobbyists contest that claim saying that the Vikos Gorge is the second deepest canyon in the World, after Grand Canyon in USA. The extremely steep walls of the Vikos Gorge rise to a height of 1,040 meters in several places, providing breath-taking views of this unique natural phenomenon. The Voidomatis River crosses the Vikos Gorge and gives beautiful natural sceneries. And the popular Dragon Lake, placed on the edge of a great limestone cliff overlooking the Aoos Valley, is a significant part of Vikos Gorge. 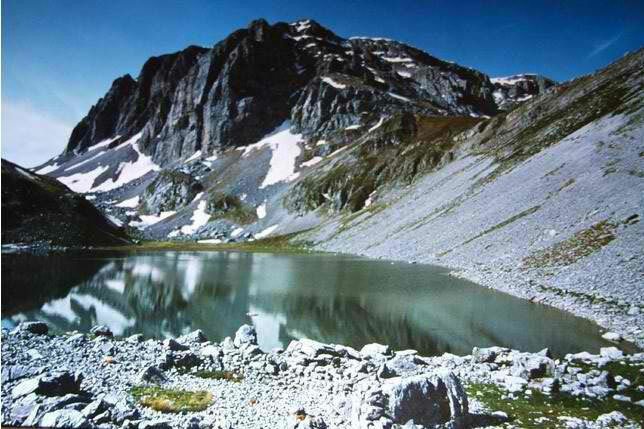 There is a phenomenal legend about the lake and it takes some hours of walking to get there from Mikro Papigo village. The Vikos Gorge has been carved over millions of years by the Voidomatis river, a tributary of the Aoös. The Voidomatis is mostly seasonal, with year-round flow occurring only in the lower part of the gorge. Due to its nature, the area of the gorge is precipitous and impassable most of the year. As the Vikos Gorge is a deep cross section of the mountain, its slopes expose series of rock formations of various ages. The upper layers, at a depth of 0–200 m consist of relatively young Eocene limestone, at a depth of 200 m –700 m they consist of a stratum from the Campanian era, while below 700 m they consist of Jurassic and Cretaceous limestone. In the deepest layers, grey Jurassic dolomite is dominant. The Vikos-Aoos National Park was founded in 1973 and extends for 126 square km. 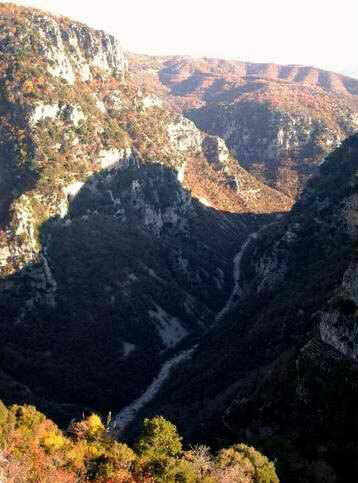 It consists of the Vikos Gorge, Mount Tymfi, the Aoos River and some Zagorian villages. It has rare species of flora and fauna, such as bears, deer, foxes and birds, which are protected by the Vikos-Aoos National Park System.